With the world’s most spectacular playgrounds right in our backyard, Denver offers easy access to the Colorado Rocky Mountains and some of the world’s most spectacular resorts. Not only is Denver a vibrant city filled with options for urban adventure, it’s a convenient base camp for a wide variety of Colorado vacations when you stay at hotels outside of Denver. For an easy outing, head west into the foothills of the Rocky Mountains to catch the scent of pine-filled forests and to check out world-class attractions like Red Rocks Park & Amphitheatre and The Fort Restaurant. Or make a day or weekend of it, testing your luck at the casinos in the historic mountain burgs of Black Hawk and Central City or panning for gold, touring the mines and boarding the steam train in Georgetown. Iconic ski resorts like Winter Park, Breckenridge, Keystone, Copper Mountain, Vail and Beaver Creek are also fairly short drives for those who like tastes of both the city and the slopes, which are now year-round meccas for outdoor pursuits, festivals and concerts. Steamboat Springs, Snowmass and Crested Butte — also on the top of favorite North American ski and snowboard resort lists — are worth the extra miles and overnight stays with plenty of charm and great culinary, lodging and spa options for pure vacation bliss. Art lovers are especially enamored with Loveland, located less than an hour from Denver, where artists from around the nation have their sculptures cast in bronze. There are also art galleries, festivals and exhibitions. From there, it’s a beautiful drive up the canyon to Estes Park and Rocky Mountain National Park. If a taste of the West is on your bucket list, head to the beautiful guest ranches not far from Winter Park in Grand County. Don’t feel like driving? Catch Amtrak’s California Zephyr from bustling Denver Union Station downtown for a comfortable and scenic ride to Grand County (Fraser year-round and Winter Park on winter ski weekends), Glenwood Springs and Grand Junction, which combined with Palisade forms Colorado’s wine and orchard country. From there, switch your mindset from mesas to canyons on the hour drive to Gateway, home to a luxury resort where you can learn, relax and try something totally new. While Denver is Colorado’s largest city, put the second-biggest one on your itinerary as well. Colorado Springs is about an hour south of Denver and has a whole different flavor and outstanding array of attractions for all ages from money, ghost town and pioneer museums to the Colorado Springs Fine Arts Center, Pro Rodeo Hall of Fame and The Airplane Restaurant, which is actually built around a Boeing KC-97 tanker. 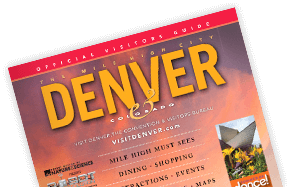 Whatever direction you head, there are 300 days of sunshine, dynamic communities, friendly residents, a healthy appreciation for the outdoors and culture, and a wide variety of opportunities for lodging outside of Denver. Along the way, there are chances to sample all sorts of craft brews and spirits made locally, stroll farmers’ markets and join in festivals that celebrate wildflowers, hot air balloons, peaches, strawberries, art, music and more. There is never a problem finding things to do; the quandary is how to narrow down the options!